By big loudspeaker standards, the Raidho TD‑4.8 isn’t actually that big. It stands about as tall as the average middle-aged European and its front baffle is about face-wide. It sits on two outriggers that give the speaker a remarkably narrow footprint. It’s deep, yes, but not that deep and is designed to work relatively close to the wall, so it doesn’t come intimidatingly far into the room. In short, Raidho’s newest addition to the family is the best big little loudspeaker they make. The core to the TD-4.8 is the ‘T’ part. Raidho moved from aluminium-oxide ceramic drivers to diamond and graphite coated aluminium-oxide ceramic drivers in its top range a few years ago, but while this gave exceptional hardness and lightness, there was a limit to just how much of a coating you can put to a ceramic cone before it fractures, and the diamonding process Raidho uses is already pushing the envelope. Enter tantalum, a material of such ductile strength and heat dissipation, it remains one of the key choices in armour-piercing bullets. A thin layer of tantalum applied to the cone gives it the strength and rigidity (without undue additional weight) to allow the cone to receive more diamond than ever. This makes for a functionally perfect cone material for all the right reasons, with only one downside – the manufacturing process. The tantalum coating process is neither cheap, nor fast, nor capable of significant upscale, meaning that where the move from ceramic to diamond-ceramic was across the whole range, the move from diamond-ceramic to tantalum-diamond-ceramic is always going to be limited to the very top models in the Raidho range. The TD-4.8 is a pure D’Appolito design, with the two midranges and six bass units flanking the ribbon tweeter. The cabinet itself is a vented sealed box, and right now you are probably saying ‘wait, what?’ but hear me out. There is a difference between a ‘vent’ and a ‘port’ but the forensic use of the terminology has been lost in recent years and many think the two terms are interchangeable. In the case of the TD-4.8, the vent is a small, heavily bunged exit point to an otherwise sealed cabinet. It’s not ported in that no air escapes but allows the loudspeaker to benefit from the speed of a sealed box with the bass extension that comes from the cabinet extension. This is also done exceptionally elegantly with five small rear ‘exhaust pipes’ that, when combined with the overall wing shape of the design, makes for a loudspeaker that looks a little like it’s some classic sci-fi wing shape, turned on its side. The finish options are for the side cheeks alone, and include a burr walnut finish, piano black, and any car paint colour you can think of. The loudspeakers themselves connect to the real world using newly designed ‘red gold’ (gold with a high copper content; not an alloy because alloys are beneath noble gold) single-wire terminals that include 4mm banana plugs. Moving from diamond-ceramic to tantalum-diamond-ceramic means the drivers look slightly less dark than before (interestingly, the normal black industrial diamond is put under such pressure in the Raidho process, it takes on a slight blue-white hue. OK, no‑one’s pressing the Koh-I-Noor yet, but this is more like what we think of ‘diamond’ than most industrial diamond processes). This also allows for a reworking of the crossover and it’s here that Benno Baun Meldgaard’s input as Chief Designer begins to shine through. 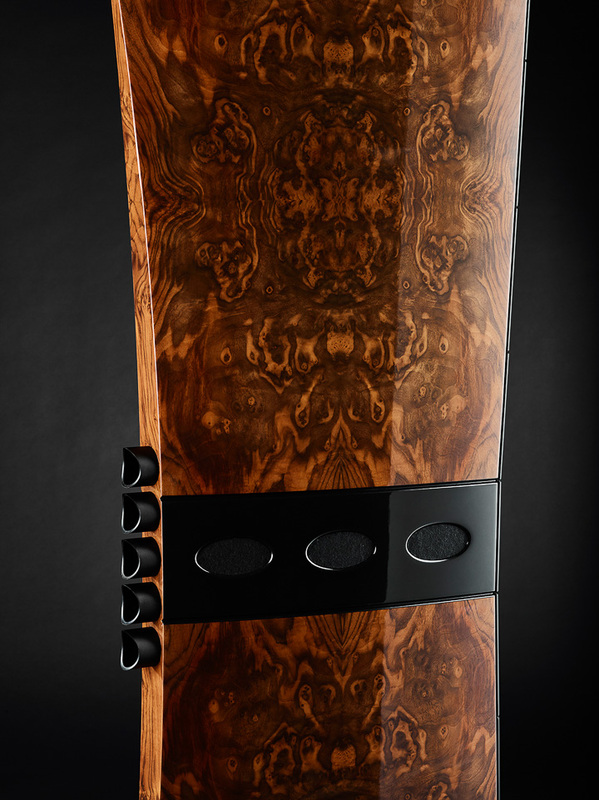 This was a project largely already signed off, so Benno’s role was primarily final voicing, but this is interesting in its own right, as it brings together the temporal and rhythmic properties GamuT speakers are so highly prized for with the vanishingly low distortion that defines a Raidho loudspeaker. In the process, Raidho has made a high-end loudspeaker that is both an easy impedance load (mostly around 10ohms, with the occasional dip below eight ohms) and a true 90dB sensitivity. This has a great advantage for high-end users, in that they can pick an amplifier on the basis of how it performs, and not simply whether it delivers enough power. In this case, it was fed by an old dCS Puccini+Clock duo, a GamuT pre/power set, and all connected up with Nordost Valhalla 2 cables. You could easily swap out the GamuT models for a reasonably sized tube amp, as those performance figures mean it’s all about quality not quantity. In all this though, the TD-4.8 remains resolutely Raidho.